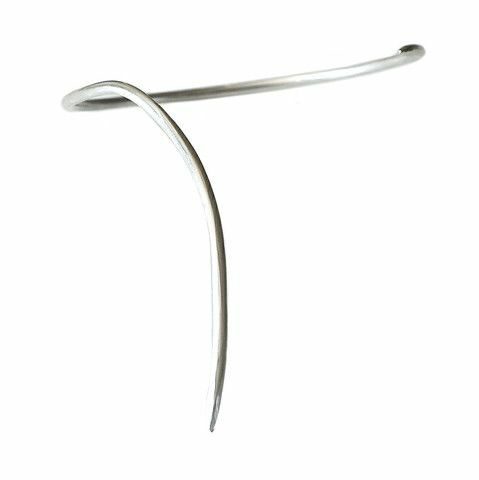 Curved somewhat menacingly around the neck, this bold yet minimal neck cuff from the Eclisse collection follows the contours of the neck and collar bone - a revealing and sensuous part of the female body. The satin hand polished finish to the neck adornment is deliberate in a way of hinting intentional imperfections and manipulations to symbolically mirror natural, decaying landscape that is wounded in battles throughout history. The name Oscuro is derived from Italian "casting shadows", emulating the shade and obscurity of an eclipse. The aesthetic and the narrative behind the neck adornment evokes a beautifully dark piece of art.